#152. Wahsatch Range - From Salt Lake City - Utah. 4.5 x 8.5, chromolithograph. Title on plate. This picture is Plate XXII in Clarence King's Systematic Geology, published in 1878. It is based on an oil sketch by Gilbert Munger, who was guest artist with King's 40th Parallel Geological Survey in 1869 and 1870. A smaller version of this image appears as the color plate "Das Wahsatchgebirge in Utah (Nordamerika)" in Allgemeine Geologie by Melchior Neumayr (1845 - 1890), published as volumes 1 and 2 of Erdgeschichte in Leipzig in 1886. David Ericson of David Ericson Fine Art in Salt Lake City identifies the left-most brown mountain as Mt. 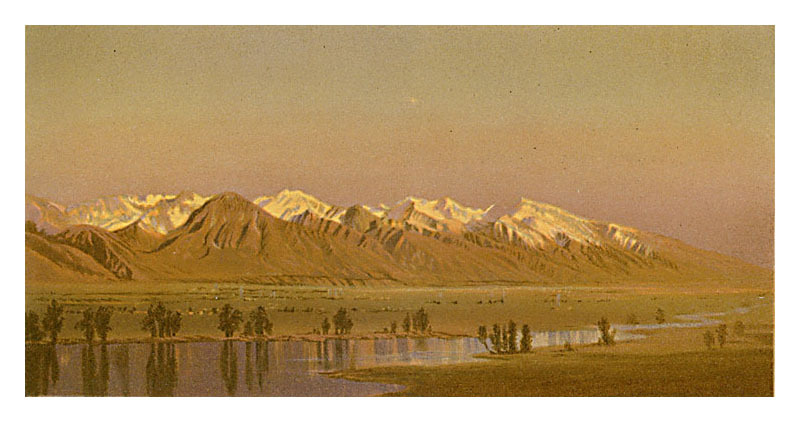 Olympus, the rightmost snowcapped mountain as Lone Peak, and the river as the Jordan. Similar in view to painting #221. (See the discussion of the Wasatch paintings here for more details.) Image is a direct scan of the Systematic Geology plate.